Published: Nov 15, 2016 · Modified: Apr 12, 2019 · By Jen Sobjack · This post may contain affiliate links. Homemade Moon Pies are cookies from my current home state, Tennessee. They are soft vanilla cookies sandwiched around a gooey marshmallow, then dipped in chocolate. Made completely from scratch, these cookies taste almost like the original MoonPie! No matter what you believe when it comes to politics, I think we all can agree that everyone loves cookies! I teamed up with Bob’s Red Mill for an incredible campaign celebrating a cookie from each state. My current home state is Tennessee and what is the one cookie Tennessee is known for? MoonPies of course. 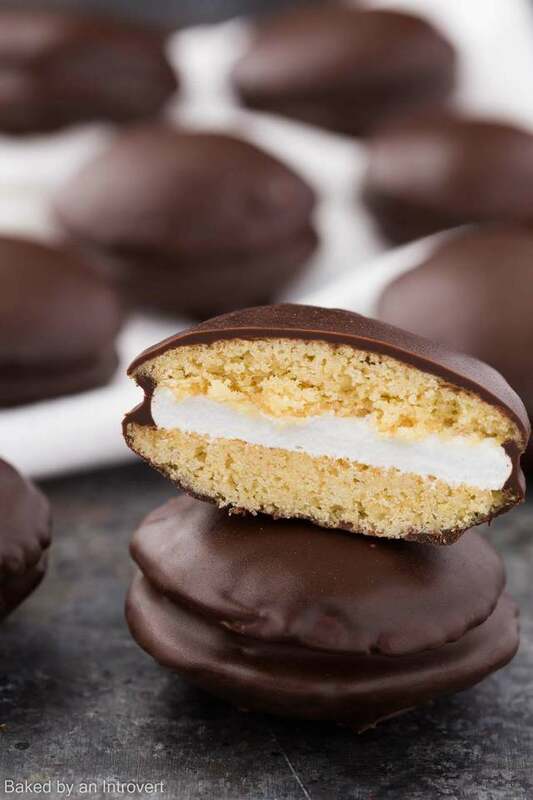 The traditional MoonPie has two graham cracker cookies sandwiched around marshmallow filling and is dipped in a flavored coating. The most popular one is chocolate but you can find them in vanilla, strawberry, and banana. MoonPies were originated at the Chattanooga Bakery in 1917. A coal miner asked the bakery’s traveling salesman for a snack as big as the moon and that is how the tasty treat got its name. The MoonPie became popular among coal miners because it was filling, fit in their lunch pails, and they were affordable. During World War II the MoonPie was a staple in care packages for the service men. Its popularity continued to grow throughout the years and currently produces about one million MoonPies a day. I’m a huge fan of MoonPies myself. I have fond childhood memories of me enjoying MoonPies with special people in my life. That’s why I’m so excited to recreate this beloved cookie. It all starts with Bob’s Red Mill Organic Unbleached All Purpose White Flour. This flour is incredibly versatile and perfect for all your baking needs. I chose the make the cookie part vanilla flavored instead of graham cracker. And the cookie is a bit more cake-like. It’s thicker but flavorful and soft. The filling is made just like homemade marshmallows. I whipped up egg whites and mixed in a hot mixture of sugar syrup with gelatin. It will hold up without melting or separating from the cookies. After sandwiching two cookies around a large “kiss” of marshmallow, dip them in a semisweet chocolate glaze. 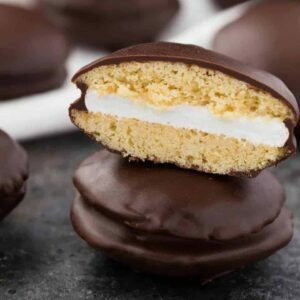 These homemade moon pies are sensational! 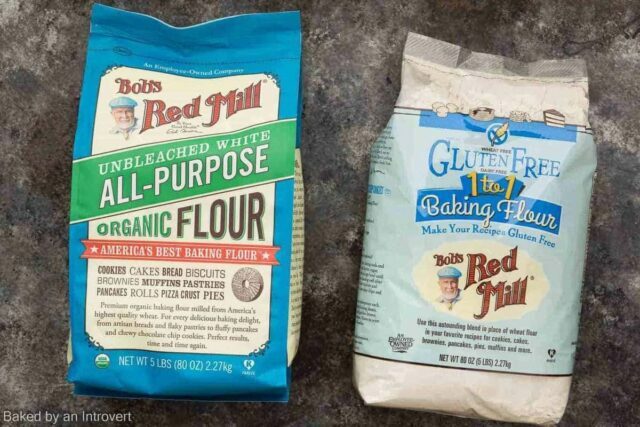 Use this Bob’s Red Mill coupon to get your bag of flour today. Also, head over to United States of Cookies to what cookies are being featured for your state! 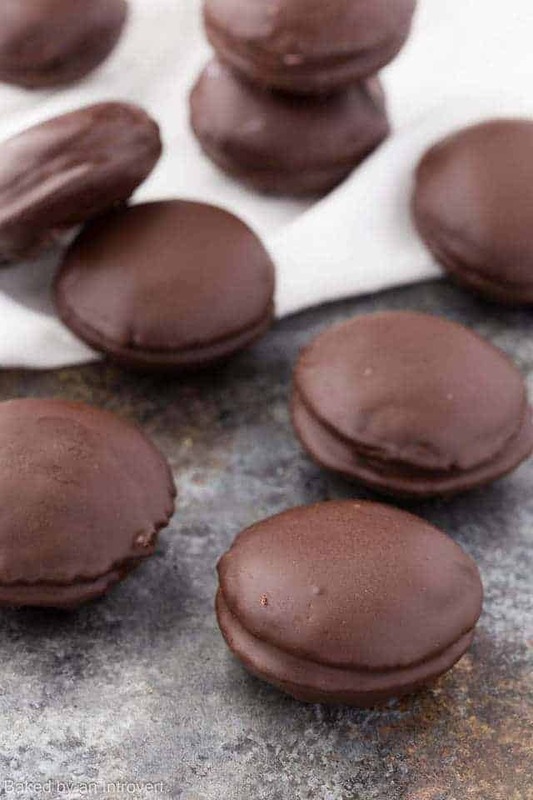 For more delicious homemade cookies, try these homemade thin mints! Homemade Moon Pies are cookies from my current home state, Tennessee. They are soft vanilla cookies sandwiched around gooey marshmallow, then dipped in chocolate. 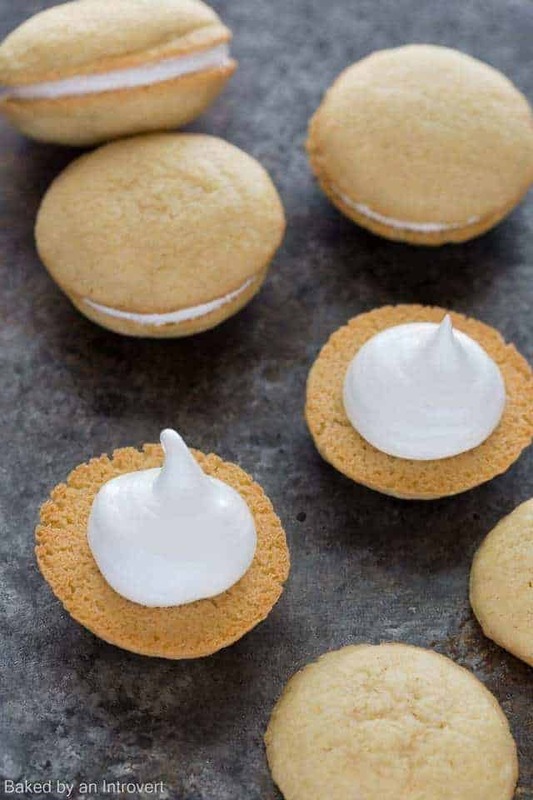 Made completely from scratch, these cookies taste almost like the original MoonPie! In a large mixing bowl, beat the butter, sugars, and salt together with an electric mixer on medium speed until well combined. Add the egg, egg yolk, and vanilla; beat until incorporated. In a medium bowl, whisk the flour and cornstarch together. Add it to the butter mixture and beat until fully incorporated. Gather the dough into a ball, cover with plastic wrap and refrigerate for at least 2 hours. Preheat the oven to 350°F. Scoop 1 tablespoon sized pieces of dough and roll them into balls. 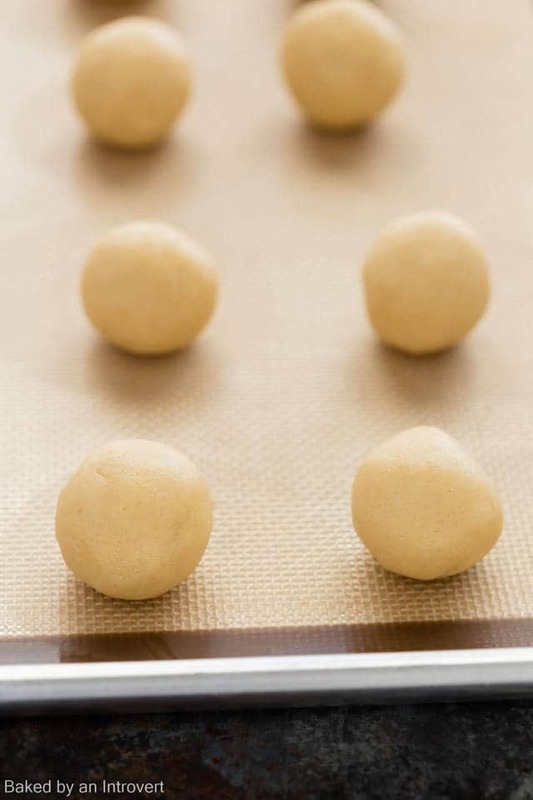 Place the balls of dough 2 inches apart on a baking sheet lined with parchment paper or silicon mat. Bake for 10 to 12 minutes or until the edges of the cookies are lightly browned. Cool on the pan for 5 minutes, then transfer to a wire rack to cool completely. Combine the water, corn syrup, and sugar in a small saucepan fitted with a candy thermometer. Bring to a boil and cook to “soft-ball” stage, about 235°F. Meanwhile, in a large bowl, beat the egg white on medium speed until soft peaks form. Transfer the marshmallow to a pastry bag fitted with a round tip. Pipe a large kiss of marshmallow on the bottom side of half the cookies. Top with a second cookie to form a sandwich. Refrigerate for 30 minutes. Add chocolate and oil to a heatproof bowl and set it over a pot of barely simmering water. Stir constantly until chocolate is melted and smooth. Working with one cookie at a time, use a fork to dip it into the bowl of melted chocolate. Flip it over to fully coat the cookie in chocolate. Tap off any excess and let it drip back into the bowl. Place the cookies on a wire rack set over a large baking sheet. Refrigerate until chocolate is set. Keep cookies stored in the refrigerator until ready to serve. Cookies with keep for up to 3 days stored in an airtight container. Now all you need is to find some RC Cola. I NEED to try these Jen! They look amazing. I haven’t had a moon pie in years. I bet your homemade ones are ten times better than store-bought! These look amazing! My husband loves Moon Pies and would go absolutely crazy over these. I’m so excited that I can make these at home now! How fun! I’ve never made my own moon pies before. They look so delicious! These look SO good, Jen! I’ve never made a moon pie before, so I think I need to start. Love that this is dipped in chocolate too…just gorgeous! Wow! One bite of this treat and there’s no going back to the store-bought version again! Beautiful! I love the “kiss” of filling! I have never heard of these treats, they sound delicious! How have I never had a moon pie before?? These look absolutely INSANE and I’ve all over ’em, Jen! Loving that marshmallow filling! !